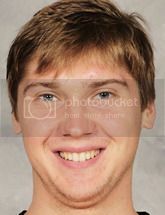 Discussion forum for Sergei Bobrovsky's fans (Columbus Blue Jackets, NHL). Please post trade rumors, injury reports and amateur scout suggestions. Please do not post inappropriate comments, this is a friendly forum for fans. If you see inappropriate comments, then please report them by clicking the report abuse link aside the comment. Comments you post may require a paid membership to delete. bobrovsky is terrible. An overweight cat could stop more pucks. SO DO MINE!!! i'm always telling them that they have a bad taste in guys! Bob is so cute! Reply-to:Ok hockey genius.....its not the goalie, maybe one of those goals were soft ones but the rest of the team is to blame for the rest. It's ironic that you refuse to blame Bobbie here when HE screwed up (which was a lot), but you will blame Boucher when he literally had NO DEFENSE. How convenient. May i remind you what the Flyers have done to every good player they've ever had? They've RUINED them. This loser goalie isn't going to be any better than the other young, "promising" goalies that everyone thought the Flyers had. They crumble under the pressure because they're pussies. Each player has their position, regardless. No way 5 goals should have been had. Boosh is the stronger goalie. Reply-to:Hey Bob, that thing you stand in front of is called the net. That thing players shoot at you is called a puck. Youre supposed to STOP the puck from going into the net. Just sayin...seems like youre not so sure about what to do. Ok hockey genius.....it's not the goalie, maybe one of those goals were soft ones but the rest of the team is to blame for the rest. Hey Bob, that thing you stand in front of is called the net. That thing players shoot at you is called a puck. You're supposed to STOP the puck from going into the net. Just sayin...seems like you're not so sure about what to do. Reply-to:I am in loveeeeeeeeee with bob!!!! <3333333 good luck in the game 2night, if u play!!! LETS GO FLYERS LETS GO!!!!!!!!!!!!!!!!!!!!!!!!!!!!!!!!!!!!!!!!!!!!!!!!! A LOT BETTER Reply-to:hes going to only get better!